The People’s Committee of Dong Thap province has honoured WWF with a medal and certificate of merit in recognition of the organisation’s contribution to the conservation of the wetland habitat in Tram Chim National Park. Dong Thap province, Vietnam – The People’s Committee of Dong Thap province has honoured WWF with a medal and certificate of merit in recognition of the organisation’s contribution to the conservation of the wetland habitat in Tram Chim National Park. The award was presented to WWF at an event today in Tram Chim National Park, and marked the official designation of the park as the first Ramsar site in the Mekong Delta. This is Vietnam’s fourth Ramsar site and the 2,000th site to be designated globally. Ramsar sites are wetlands of international importance, designated under the Convention on Wetlands, called the Ramsar Convention. Tram Chim National Park, located in the Mekong Delta province of Dong Thap, is one of the last remnants of the original wetland landscape of the Plain of Reeds, a vast wetland area of about 13,000 km2 in the provinces of Dong Thap, Tien Giang, and Long An (Lang Sen) in Vietnam, and part of Svay Reang in Cambodia. The Park has tremendous biodiversity, including over 230 bird species and 130 fish species. 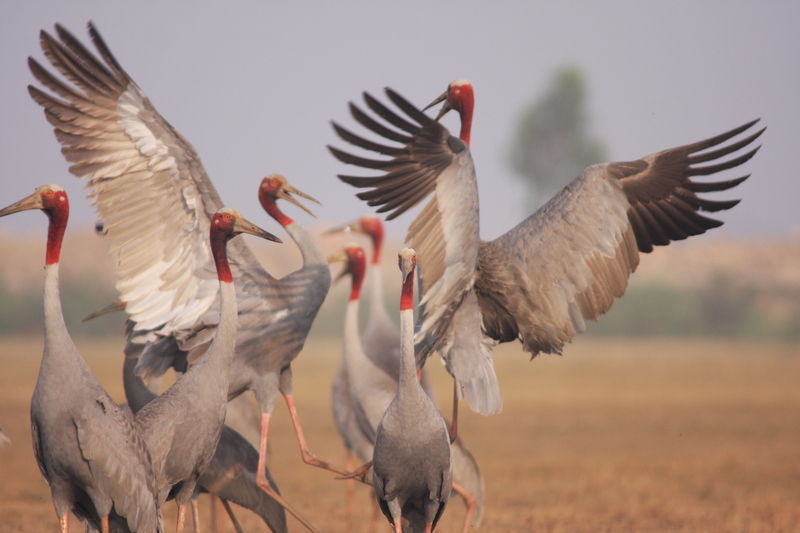 Its most striking visitor, the Sarus Crane, is listed as endangered on the IUCN Red List and visits annually from the end of January through to mid-May. Under earlier management efforts, water was permanently stocked in the park in order to suppress fire. However, the wildlife in Tram Chim is adapted to a six-month dry season and a six-month flood season, and year-round water stocking was interrupting the natural rhythm. As a result, habitats dwindled and species disappeared. 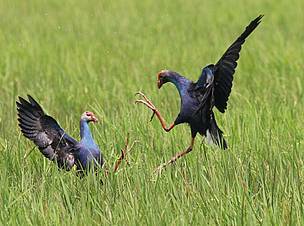 Importantly, the purple spikerush (Eleocharis atropurpurea), the main food of the Sarus Crane, was reduced significantly due to this regime, thereby reducing the number of these birds at the site. Since 2008, WWF has been working with the park authorities to restore the habitats of Tram Chim and to mimic its natural and historical conditions. The work was delivered as a part of a global partnership between WWF and The Coca-Cola Company in which the two organisations work collaboratively to conserve seven freshwater river basins around the world, including the Mekong River. Tram Chim National Park was the first wetland protected area in Vietnam to adopt an ecosystem based management approach and involves rehabilitating ecosystem processes and providing legal access for communities to wetland resources. This was a major deviation from standard practice at the time and has yielded strong results, including the recovery of many of the bird species at the park, such as the Sarus Crane. “The innovative management approach in Tram Chim has delivered positive results and we encourage other important conservation sites throughout the country to learn from and replicate these efforts,” added Marks. In addition to stocking water permanently, the previous management regime excluded locals from the park. This gave locals little option to legally access the wetland resources on which they depend for their livelihoods, particularly fish. Under the new management approach, local people have been provided with legal and sustainable access to wetland resources. This encourages locals to help manage the resource sustainably and thereby become partners in conservation. In 2011, WWF and the Biodiversity Conservation Agency (BCA) – the Government focal point for Ramsar under the Ministry of Natural Resources and Environment, signed a MoU to commit support to efforts in five wetland sites in the Mekong Delta to pursue Ramsar designation in the years to come. 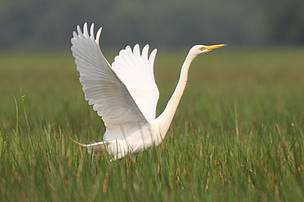 “Vietnam has many wetland sites that offer high potential for achieving Ramsar site status. The Government is committed to supporting these sites to meet the criteria set by Ramsar. We believe that with the support from WWF and other organizations that care about wetland conservation, the Mekong delta will have not only one but many more Ramsar sites in the future.” Dr. Pham Anh Cuong, the Director of BCA said. Alongside the award ceremony in Tram Chim National Park, experts and authorities from the 13 Mekong Delta provinces gathered at the 4th Mekong Delta Conservation Forum (May 21 - 22) to discuss the importance of wetlands for livelihoods and conservation. The Forum is a WWF initiative that encourages stakeholders from all sectors to discuss concerns and opportunities for sustainable development of the Mekong Delta. After three years of successfully organising the forum, WWF handed over the ownership to the government and the 4th Forum was initiated by the Ministry of Natural Resources and Environment (MONRE) in co-operation with Dong Thap province’s People Committee, with support from WWF.